Carmen is a 1915 American silent drama film directed by Cecil B. DeMille. The film is based on the novella Carmen by Prosper Mérimée. The existing versions of this film appear to be from the re-edited 1918 re-release. Carmen was praised as a “triumph of superb acting and magnificent scenery” in Motion Picture Magazine. “No small share of this artistic success is due to Mr. Wallace Reid’s sympathetic interpretation of Don José,” they added. “The ‘Carmen’ film will, in its own way, stand alongside ‘The Birth of a Nation’ as an epochmaker,” Photoplay said in their review. One of their few complaints was on the film’s faithfulness to Carmen’s character of the Mérimée story. 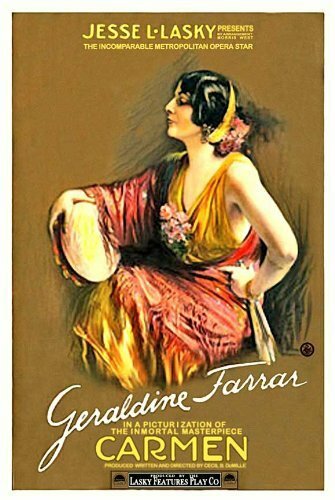 Geraldine Farrar came in fourth place in the 1916 “Screen Masterpiece” contest held by Motion Picture Magazine for her performance as Carmen, with 17,900 votes. She was the highest ranking actress and was behind Francis X. Bushman in Graustark, Henry B. Walthall in The Birth of a Nation, and the number one winner, Earle Williams, in The Christian. Theda Bara’s performance of the same role received 9,150 votes.